Repair Melted Siding for the Last Time. How to fix Low-E window reflection from your neighbour’s house. Is the vinyl siding on your house melting or warping? A more common problem than homeowners realize. It is almost always caused by the sun reflecting off a nearby window onto your vinyl siding. 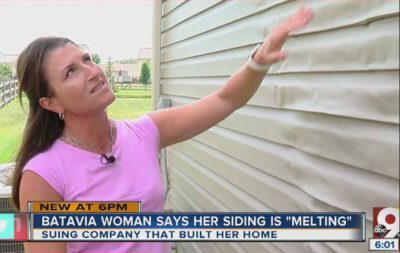 Ohio woman suing home builder after her house began ‘melting’. New low e windows act like a magnifying glass, concentrating the sun’s energy onto a small area. Temperatures in these hot spots often exceed the melting temperature of vinyl siding, causes thousands of dollars in damage. Typically, most vinyl siding products will start to melt and warp when they reach 160 to 165 degrees Fahrenheit. On darker colored siding, temperatures have been recorded of nearly 220° F in the area where reflected light is hitting. Is melted vinyl siding a new problem? 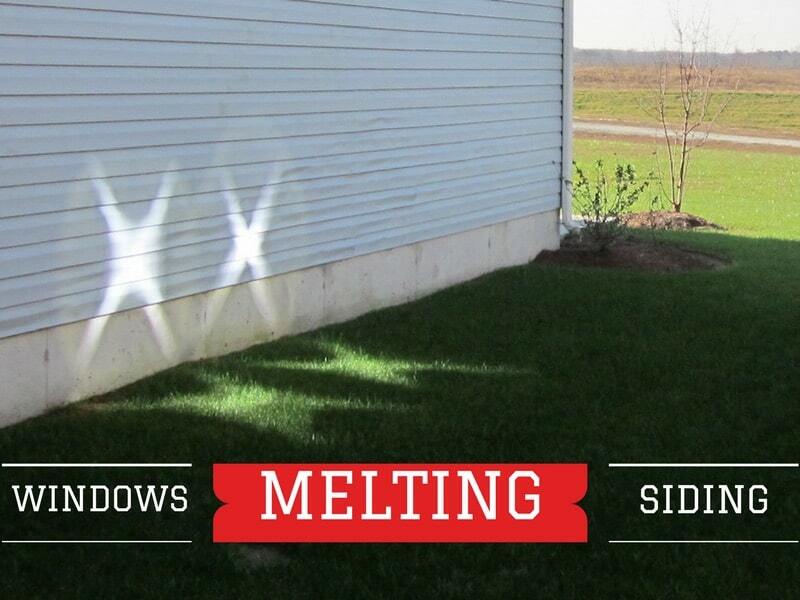 Melted siding from window reflection is a problem that has become more common in recent years. The main reason is the increasing number of Low-E or energy efficient windows that are being installed in new homes or renovated homes. Low-E windows are designed to reflect more heat away from the glass by design. That is why low e windows help cool your home. The problem is that reflected light off these windows is now more powerful than ever and it substantially increases the surface temperature of the objects it lands on, like vinyl siding or artificial turf. Glass in double paned windows may on occasion slightly warp or deflect due to a difference in barometric pressure between the interior of the glass panes and the outside air pressure. This can create a concavity in the glass. Such a concavity is a normal response to pressure differences, does not affect the performance of the window, and does not constitute a defective window condition. However, the concavity may focus sunlight reflected from the window in a fashion similar to the effect seen when light passes through a magnifying glass. The heat generated by the focused reflected sunlight has proven sufficient to visibly damage and distort vinyl siding on nearby houses. A combination of contributing factors must be present before the effect occurs or causes damage to any nearby materials, including vinyl siding. The presence of the concavity in the double glass panes (resulting in the magnifying glass effect with a focused light beam) appears to be the primary cause of the heat generation, more so than the mere increased reflectivity of the low-e window. The angle of the sun is also a factor. A low angle of sunlight (such as might occur in late fall, winter, or early spring) is more likely to produce the effect. Other factors, such as proximity to the adjoining house, wind speed, air temperature, and the presence of buffering foliage are all said to have an impact on whether a damaging reflected sunlight effect does in fact occur. The intense reflection from low-E windows is reported to have caused other kinds of damage, as well, such as melted plastic trash bags and plastic garbage cans, melted plastic solar collectors, melted plastic parts of vehicles, and melted housewrap on new builds yet to be covered with siding. Four house fires were confirmed to have been caused by such reflections, according to an investigation by the Consumer Product Safety Commission. In these cases, reflections from sunroom roof glass and skylights ignited nearby cedar shingles. The hazard is not limited to property. One new high-rise hotel in Las Vegas reportedly gave off reflections hot enough to burn people using the hotel pool. Windows with standard glass panes can cause similar damage in some situations, but this is rarely reported. The easiest and most effective way to stop reflecting sun rays from melting and warping your vinyl siding, is to block those rays. Stops the Sun: Exterior window shades stop intense sun from passing through your windows and also stop reflection off the outside of the glass. You end up not only stopping the sun from melting the siding, but the exterior window shade also substantially cools the room with the window. Easy & Quick Installation: A do-it-yourself exterior shade system like the EZ Snap exterior shades can be easily installed be someone with no previous experience. Inexpensive: They are also very affordable, costing as little as $1.70 per square foot. If the offending window happens to be on your neighbour’s house, they are so affordable, you can offer to install the EZ Snap exterior shades for free for them. This saves them money on their air-conditioning bill and you instantly stop the sun from damaging your vinyl siding. The solution to this problem is to stop the sun’s rays before they can hit the glass and reflect off of the glass surface. When you install the EZ Snap exterior shades on your windows, it is like planting an instant shade tree in front of the offending window. 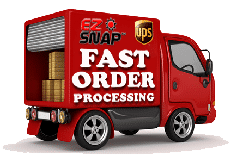 EZ Snap stops up to 90% of the sun’s rays from reaching the glass. The remaining 10% that does get through is reflected back, but must then pass through the EZ Snap mesh a second time. Again, reducing it a further 90%. With 99% of the reflected light now eliminated, the problem of melted vinyl siding is also eliminated. Cools the interior of your home and surface of the glass. Reduces annoying glare inside and out. Lowers your air conditioning bill. Prevents birds from flying into the reflective glass surface. Reduces the fading and damage caused by the suns U.V. rays. Like EZ Snap, replacing your vinyl siding with cement board product like Hardy Plank is a guaranteed fix. Unfortunately, replacing your siding is a time consuming and very expensive solution. A siding repair or re-install is also beyond the ability level of most do-it-yourselfers. When replacing your vinyl siding with Hardy Board, in extreme cases, there’s still potential for the extreme heat to discolour or damage the painted surface of your new siding. Angie’s List Video – Are Your Neighbor’s Windows Melting Your Siding? Related Article – Do Your Windows Have the Power to Melt the House Next Door?